Exercise Odds and Ends | Keep It Up, David! My two most recent posts were about my short trip to Vegas last week… but what’s been going on lately? I’ll tell you – a whole lot of exercising! My training for the San Diego TowerTHON is coming along swimmingly, and I’ve done a few things since returning from Vegas that make me proud. 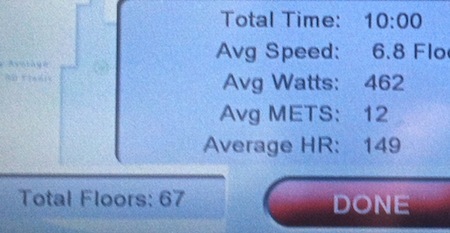 1) A New StairMaster Record. Last fall, while prepping for Hike the Halo and the CF Climb, I began tracking how many floors I could climb in just 10 minutes on a StairMaster. My 2013 record was 63 stories (set on 11/3/13). 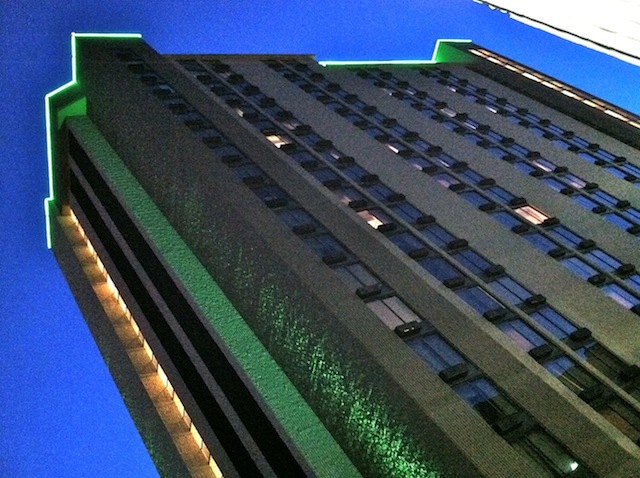 A few months ago, while training for Scale the Strat, I beat that record, climbing 65 stories on 2/21/14. I knew that record would be hard to beat, because climbing 65 stories in 10 minutes requires a mighty hustle, but the other day I gave it a go, and after 10 minutes, I had climbed… 67 stories! BLAMMO! May 19, 2014 is in my calendar as a record-setting day. Will I be able to beat this record? Only time will tell. To get to 67 required me to climb at level 14 for nearly 5 minutes, and that’s exhausting. Beating that record will be difficult. Difficult, but doable! 2) More Hotel Stairs. I’ve already written about my awesome stairwell workout at the Paris hotel in Las Vegas, but those weren’t the only hotel stairs I climbed last week. 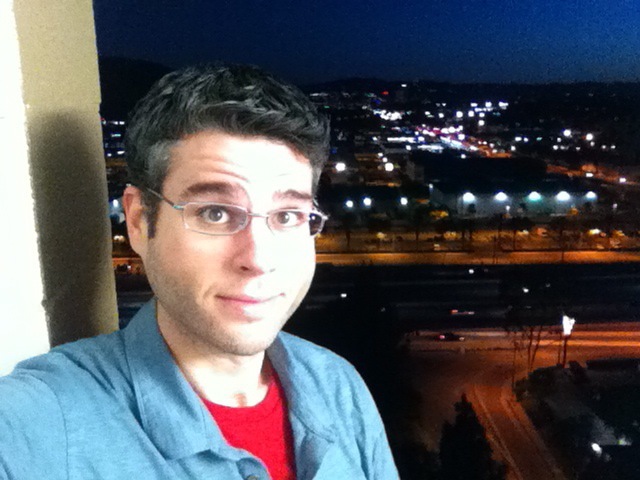 A few days later, I went to an event at a bar on the 18th (and top) floor of the Holiday Inn in downtown Burbank. Even though I had come freshly showered and changed after a workout at the gym, I didn’t pass up the chance to take the stairs. Sorry for the crappy picture, but it was already dark. 3) Step Class. There’s a step class offered at Slimmons every Friday. I haven’t been in a few years, but my schedule was pretty open last week. Since steps have become such an important part of my life lately, I decided to stop in, and I’m glad I did! I actually wrote a blog post about this step class way back in 2010, and not much has changed. Some of the moves are different, but it still follows the same basic structure, and it’s still crazy difficult. It’s led by Anne, who’s the toughest teacher at Slimmons (which means, naturally, that I love her classes). After a warm-up, the real work begins. Anne teaches step patterns and choreography, and alternates step moves with toning exercises using free weights. Some of the toning moves require heavy weights, and some require light weights, so you prep your area with both before class. I did nearly the entire class using a step with four risers on each side, and Anne said afterwards that in all her years of teaching step, she’s never seen anyone do that. (!) 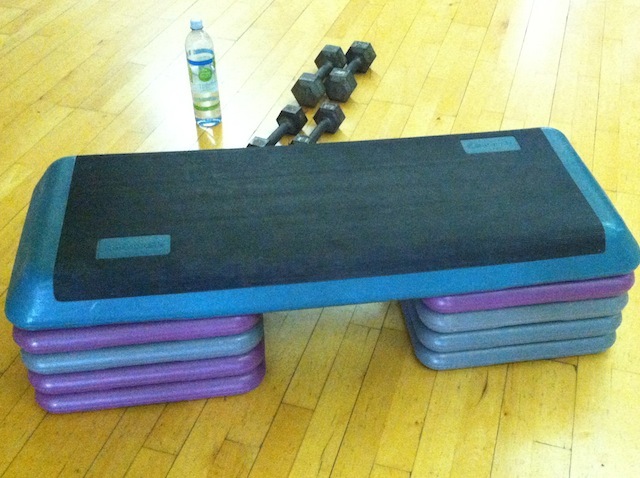 Most people, even tall people like me, use three risers or less. I did the final two moves with three risers, as the choreography was difficult and I was afraid I might trip, but the next time I take the class (and I hope it’s soon), I’m totally gonna do four risers the entire time! 4) Back to Universal Studios. I had a light bulb moment at midnight the other night. 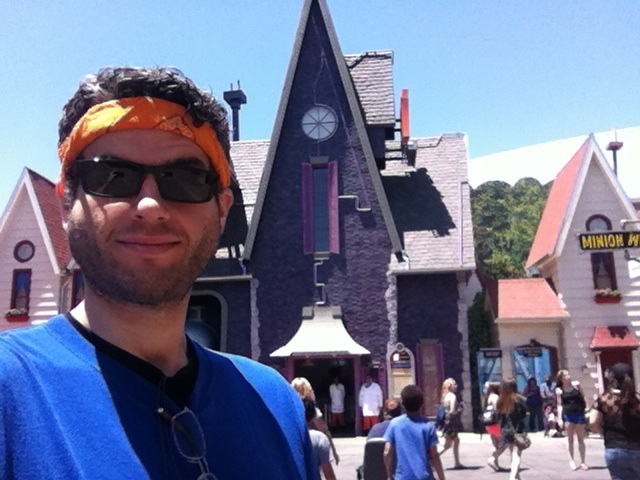 I bought an Annual Pass to Universal Studios Hollywood a few months ago, and I’ve been meaning to go back before it gets too crazy with the summer crowds. It occurred to me at midnight that the next day was the only day I could go before the official summer season kicks off during Memorial Day weekend. So, at 8:30am the next day, I was off to Universal Studios. Universal Studios may be a theme park, but my top priority was working out. There’s a 345-step stairway there, called the Starway, and it’s an excellent stair-climbing training locale. I took oodles of pictures when I blogged about this back in March, so click here for everything you need to know about the Starway (it’s actually much more than you need to know). Last time, in addition to warm-up and cool-down climbs, my workout consisted of three main ascents. This time around, I did six. And how’s this for consistency? I finished each and every climb somewhere between 3:40 and 3:56. My fastest climb (the 3:40) was actually the fifth one. Add in the time it took on the escalators to get back to the bottom, and this workout lasted 52 minutes. And I was pooped. 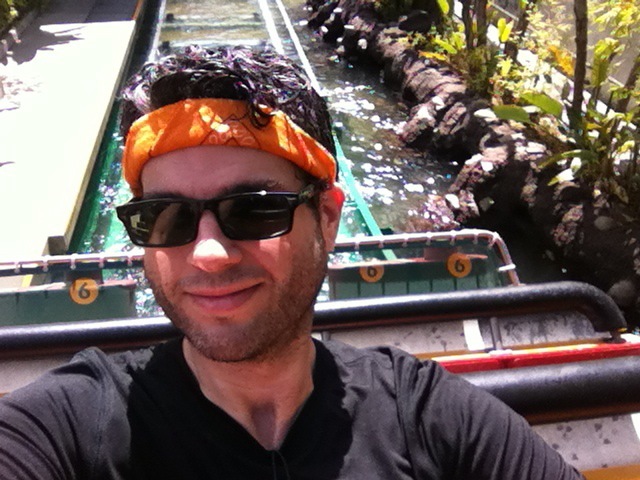 Time to cool down on Jurassic Park: The Ride! I walked right on the ride. The boat holds about 30, but there were only two other people on mine. Awesome! Then I walked right on the Transformers and Mummy rides. After that, my 7th and final ascent up the Starway, which netted my best time of the day: 3:31. After that, I rode The Simpsons, and the brand-new Despicable Me ride, which is called Minion Mayhem. This entry was posted on Wednesday, May 21st, 2014 at 12:01 am and is filed under Uncategorized. You can follow any responses to this entry through the RSS 2.0 feed. You can leave a response, or trackback from your own site.